Star Wars fans traveled to the (not quite literal) edge of the galaxy during the second day of Star Wars Celebration on Saturday, when Disney unveiled details about the soon-to-launch attraction, Galaxy's Edge. A lot about Star Wars: Galaxy's Edge was announced at the event, and we've got you covered with all that you need to know. Frozen voice actor Josh Gad hosted the panel for Star Wars: Galaxy's Edge, which is meant to be "the ultimate Star Wars playground," according to Asa Kalama, an executive creative director of one of the attraction's two main rides, Millennium Falcon: Smugglers Run. Those closer to California can look forward to Galaxy's Edge opening in Disneyland Park at the Disneyland Resort in Anaheim on May 31; those on the opposite coast of the U.S., down in Florida, will get to visit Galaxy's Edge in Disney's Hollywood Studios at Walt Disney World Resort in Orlando starting on August 29. Park attendees can experience Millennium Falcon: Smugglers Run at launch in both parks. The attraction gives riders (six per ride) the chance to pilot the Millennium Falcon in all sorts of ways: steer the famous starship once helmed by Han Solo himself, work as an engineer and patch up any problems that arise, or serve as a gunner under the orders of Hondo Ohnaka, the former leader of an Outer Rim pirate gang who, in the Star Wars lore, once kidnapped Obi-Wan Kenobi and Anakin Skywalker. 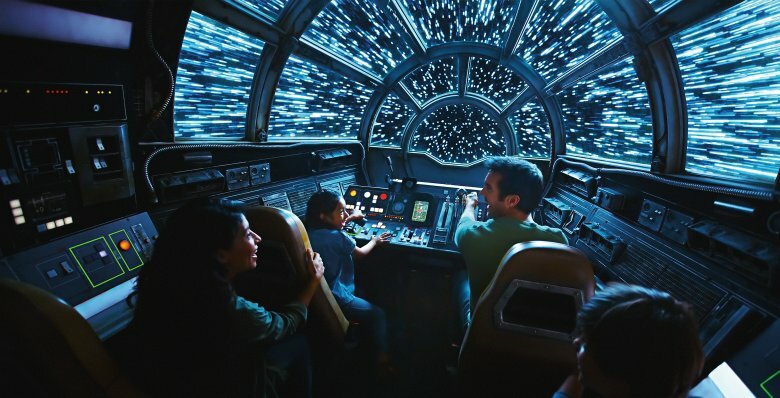 Kamala noted that "everybody has a very important role to play" while riding Millennium Falcon: Smugglers Run, while Lucasfilm executive creative director Doug Chiang shared that the Millennium Falcon in Galaxy's Edge is "the real deal," closely matching how the ship looks on the big screen (via USA Today). "We wanted an opportunity for you to live your own Star Wars experience," added Kamala. Disney's official description for Millennium Falcon: Smugglers Run reads, "Ride in the famous cockpit of the Millennium Falcon on a daring flight—and whether you're a pilot, engineer or gunner, every role is crucial. The engines rumble as the Millennium Falcon blasts off, pushing you and your crew back into your seats when you jump into hyperspace towards adventure. Along the way you'll face danger at every turn. Will your mission succeed or fail? It's up to you—find out if you have what it takes to outmaneuver the odds aboard the Millennium Falcon. Get ready to punch it! Never flown a starship before? Hondo Ohnaka is looking for discreet flight crews to deliver a backlog of hard-to-find items to particular clientele — no experience necessary!" Later this year, the second Galaxy's Edge ride will open — Star Wars: Rise of the Resistance. The attraction doesn't yet have a concrete launch date, but make no mistake about it: people will flock to it as soon as Disney pulls the curtains back. Characters including Rey (Daisy Ridley) and Poe Dameron (Oscar Isaac), plus the nefarious Kylo Ren (Adam Driver) and the adorable droid BB-8 are featured in Star Wars: Rise of the Resistance, which Disney Imagineering portfolio creative executive Scott Trowbridge says is "one of the most complex attractions we or anybody else has created." During the Galaxy's Edge panel, Disney released a stunning piece of concept art that displays the ride's Resistance shuttle that transports riders "off world," sending them on an epic escape from the First Order. There's much more to Star Wars: Galaxy's Edge than these pair of rides, however. At the attraction, visitors can traverse through the Black Spire Outpost marketplace on the planet Baatu and unwind at Oga's Cantina. The Black Spire Outpost gives guests the chance to design their very own lightsabers at Savi's Lightsabers, stop by Dok-Ondar's Den of Antiquities where "space meat" cooks on a flaming podracing engine, purchase remote-controllable droids at Mubo's Droid Depot, buy plush "pets" at Bina's Creature Stall, and expand their Star Wars toy collections with trinkets from the Toydarian Toyshop. Over at Oga's Cantina, the Cantina band Figrin D'an and the Modal Nodes will play brand-new music as guests sip on "strange and out-of-this-world" beverages. Rex, the Star Tours ride droid whose real name is RX-24, will act as the Cantina's DJ — and Paul Reubens (a.k.a. Pee-Wee Herman) returns to voice him. Matt Martin, a Lucasfilm story group member, revealed during Star Wars Celebration the backstory he created for Rex and explained how he came to be a DJ: "The short story is Rex flunked his way out of Star Tours, and eventually through some misadventures, he found his way to the Rebellion in the final battle of the galactic civil war, the battle of Jakku. In an epic TIE Fighter chase, he ends up crash landing on Baatu. There, he is rescued by the local droidsmith Mubo, where he is repaired and made into a DJ for Oga's cantina." Imagineering story editor Margaret Kerrison also said, "We were super excited to bring him back and no one was more excited that Paul. He brought in a lot of inspiration and new lines for us. Let's just say you will be thoroughly entertained in Oga's Cantina." One of the coolest aspects of Galaxy's Edge is its interactivity: visitors can download the Disney Parks Play app and use their mobile devices to hack droids and computers in the Black Spire Outpost, translate the alien languages written on signs and screens, use a tuning tool to listen in on secret conversations, and scan barcodes on props throughout the land. And as you walk through Galaxy's Edge, encounter a famous Star Wars character you might. That's right — Yoda is a part of the attraction. 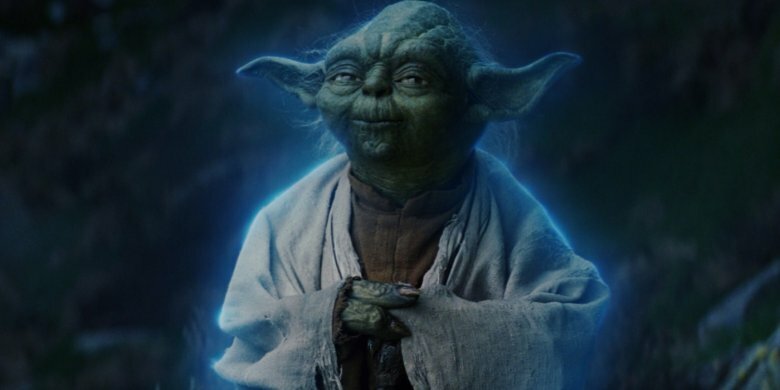 Imagineering creative director Chris Beatty confirmed that original voice actor and lead puppeteer Frank Oz will lend his voice to Yoda for Galaxy's Edge. "The force is a very mysterious thing, and sometimes, maybe Jedi from the past can visit us and be part of your experience. Maybe a small, green Jedi," Beatty teased (via Entertainment Weekly). When Gad asked who would be voicing Yoda for the new Disney attraction, Beatty said, "I think the name you want me to say is Frank Oz." Also featured in Galaxy's Edge is the fan-favorite alien pilot Nien Nunb and new music from legendary Star Wars composer John Williams. 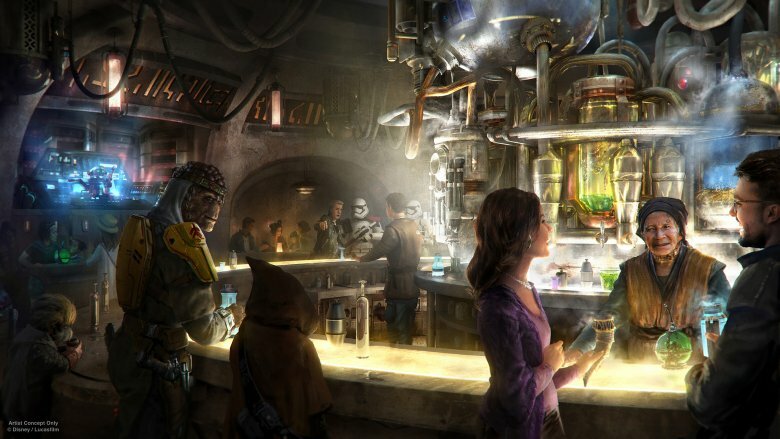 Star Wars: Galaxy's Edge will feel incredibly immersive, but the one element that might take visitors out of the experience and remind them that they aren't actually part of the Star Wars universe is Disney's collaboration with Coca-Cola for the attraction. Specially designed Coca-Cola bottles — in the shape of grenades and displaying labels written in the Star Wars language Aurebesh — will be available to purchase throughout the restaurants and kiosks in Galaxy's Edge. "We have a long history with Coca-Cola, dating back to the opening of Disneyland Park and the 'Refreshment Corner' on Main Street, U.S.A. in 1955 and it's a pleasure to continue to work with this amazing team on such a groundbreaking experience. These unique Coca-Cola products were created with storytelling in mind and are unlike anything we've done before," said Trowbridge in a statement released alongside the Galaxy's Edge Star Wars Celebration panel. He also told CNN Business, "It's unlike any Coke product you've seen before. The graphics, the shape of the bottle itself, the cap — all that stuff is very unique to the world and the design language of Star Wars." Some aren't too keen on the idea of having real-world products inside Galaxy's Edge, a place that's supposed to be deeply absorbing. One fan tweeted as the announcement happened live, "WOW. The Galaxy's Edge panel just completely lost me. Are you all seeing this coca-cola commercial in the middle of the panel? Are they dead serious? Yeah, one problem guys…Coke doesn't exist in Star Wars!! Thanks for the immersive experience." If guzzling down a Coke in Star Wars: Galaxy's Edge doesn't appeal to you, the attraction does offer a more authentic thirst-quencher: blue (and green) milk available at the Milk Stand, where you can feel exactly like Luke Skywalker (Mark Hamill) did in Star Wars: The Last Jedi. 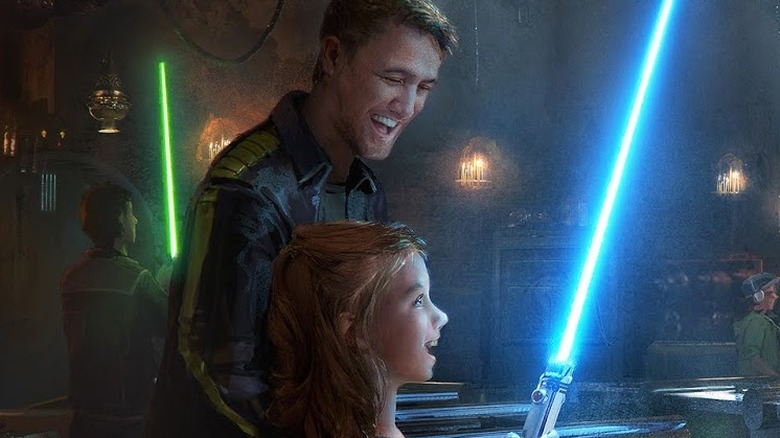 There's something for everyone at Star Wars: Galaxy's Edge — whether you're young or old, big or small, a super-fan or someone wanting to learn all there is to know about the epic franchise. Visit the attraction at Disneyland in Anaheim starting on May 31, and at Walt Disney World in Orlando beginning on August 29. After that, head out to see the latest entry into the film series, Star Wars: The Rise of Skywalker, in theaters on December 20.